A non phalate plastisol ink that is Part of the stand-alone Pyramid Range of Textile inks. 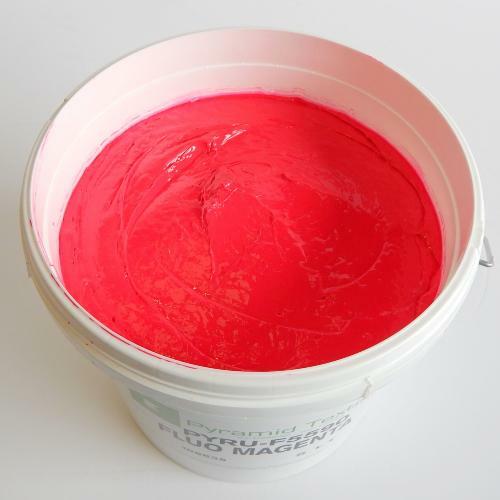 These fluorescent colours not only provide great vibrancy as stand-alone colours, but the addition of these to a colour match will add both accuracy and cleanliness of colour. Given the nature of these pigments, they are only medium opacity, and will therefore require a white underbase for printing onto dark garments. Pyramid Plastisol inks have a consistent smooth ink transition through mesh to garment. Suitable for Cotton garments and also poly/cotton blends.